The dining scene in Arlington tends to ebb and flow a bit, and some complain that it continues to be pizza central after all these years, with more pizza places (and banks, but that's another story) per capita than any other community east of the Mississippi. But this northwest suburb of Boston does have some very good restaurants--and occasionally, some true destination spots such as the sublime sushi place Toraya--and among some of the better options is a closet-sized eatery in the heart of the center of town called La Victoria Taqueria. And while the place isn't very well-known outside of Arlington, it could easily be included among the best Mexican restaurants in the Greater Boston area. When people say that La Victoria Taqueria is tiny, they aren't exaggerating; set in a storefront just off Mass. Ave. along Medford Street, the restaurant is one of several blink-and-you-miss-it storefronts across from the Regent Theatre, and somehow the people behind the place have managed to squeeze in a few tables along the left and right walls. When it gets busy, the line of people becomes a partition of sorts between the left and right row of tables and it can get a bit confusing with some people in line waiting to place an order while others are actually waiting for their orders. Small as it is, however, La Victoria Taqueria's space is rather attractive, with warm, rustic, and old-looking wood paneling and a similarly attractive sign out front that is made of reclaimed wood as well. 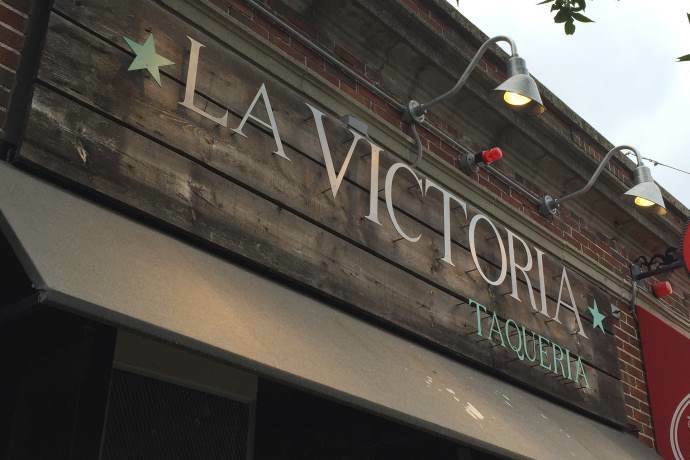 The Arlington location of La Victoria Taqueria is actually a second shop from its owners, as the original resides in the North Shore community of Beverly, and like that restaurant, this outlet offers great takes on inexpensive Mexican street food. A good place to start is with the tortas, which are basically more substantial and somewhat sloppy (but in a good way) versions of tacos and could be considered a type of Mexican sandwich with various items stuffed into them. A few options for tortas include the Choriqueso with Mexican sausage and cheese, the Victoria that has a perfect mix of pork carnitas and ham, the Vegetal for those who are looking for an alternative to meat, and the Milanesa which has a breaded chicken fillet. As delicious as the tortas are at La Victoria Taqueria, the tacos here may be even better, as the earthy taste of the fresh soft corn tortillas really stands out and blends perfectly with such fillings as the rich marinated pork or the tender shaved steak along with the cilantro and salsa. Quesadillas and overstuffed burritos are also worthwhile options, with the former being stuffed with rice, beans, pico de gallo, and meat/veggie options, and the latter being a gooey mix of cheese and meat, with the marinated chicken being a particularly good option for this dish. A basic--but very tasty--dish is the Plato Mexicano, which includes Mexican rice, black beans, pico de gallo, sour cream, and a choice of meat, with the pork carnitas going very well with the rice and beans. A special that is offered is the enchiladas rojas plate, which comes with a hearty-tasting sauce. Sides include the aforementioned rice and beans along with chips and salsa and a freshly-made guacamole that is chunky and a bit strong on the onions, though not to the point of being overpowering. Prices for all dishes are quite cheap, as nothing comes close to the $10 mark. Whether Arlington is a destination town for dining or not is up for debate, but there are certainly some destination dining spots within the community, including this relatively new Mexican place that locals are really starting to discover now. Don't expect comfy digs or upscale dishes at La Victoria Taqueria, but if you're a fan of cheap, quick eats that are made using top-quality ingredients, this is definitely one of the best choices in Arlington--or anywhere in the Boston area, for that matter.